I have always been a huge fan of the Justice League. I enjoy the stories we gain by our favorite super-heroes teaming up. Issue #9 focuses more on the league at a more personal level. Synder has the team resting at the Hall of Justice. The Hall has become a sanctuary for the members to express themselves with the specific “domains” they have created for themselves. It’s nifty tour that Wonder Woman and Aquaman narrate for us. 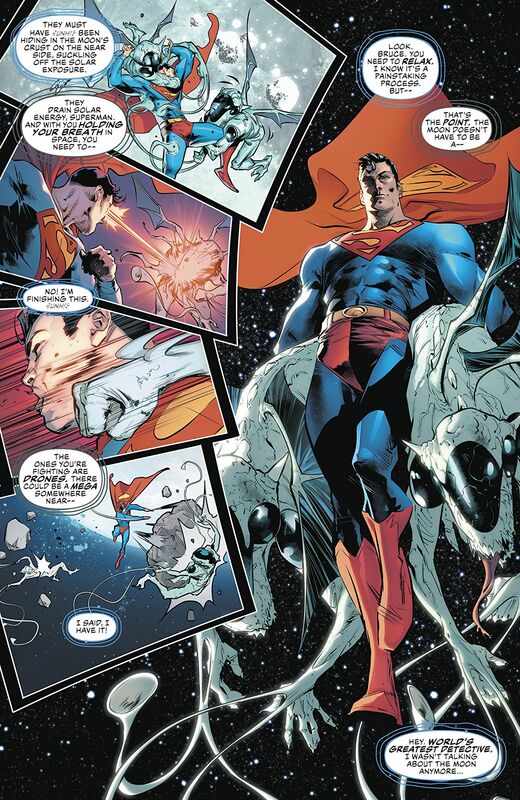 There is no shortage of action as Superman does something super by reassembling the moon. He has a fantastic dialog with Batman in the process. Superman’s task does come with it’s challenges. Jorge Jimenez’s work isn’t one I’m totally familiar with, but his work is beautiful. I enjoyed how he lights each of his subjects. He is definitely comfortable with the various members of the core Justice League. This issue is set up to prepare the League for the battle with the Legion of Doom and the dying multiverse. It’s a nice and conformable story to get us even cozier with the Justice League stories to come.